Compound Interest: The slow, but sure way of making money! Compound Interest is a mathematical principle that creates those staggering growth curves we have all seen. Understanding Compound Interest is of great importance as a trader because it teaches you many lessons that are critical to internalize if you want to stay on top of your game. It works so well because you let your money work for you. The graphic below illustrates the power of Compound interest. The starting point is a trading account with $10,000 and a trading system with a winrate of 55%, an average position size of 2% and the average Reward:Risk ratio (or R-multiple) is 2. 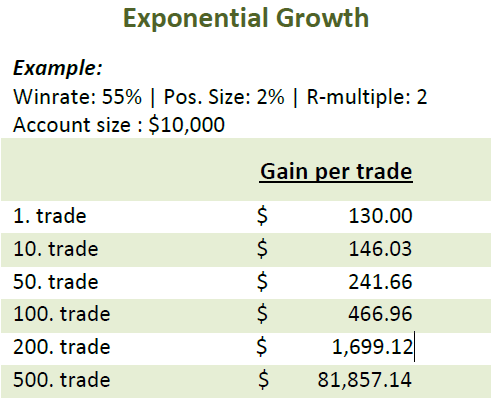 If you multiply these figures out, you get a trading system with a trade expectancy of 1.3% – this means that every trade has an expected outcome of 1.3% over the long-term. So with a trading account of $10,000 the first trade has an expected outcome of +$130. After some more trades, your account has grown to $15,000 – at this point, the 1.3% are +$195 per trade. Although the change from $130 per trade to $195 per trade doesn’t seem big, but keep in mind, you don’t have to do much different; you are still trading the same system with the same metrics. After some more trades, your account is now at $20,000 and the 1.3% are now worth $260. This is still the “slow growth” period for your trading account and the toughest period for any trader. After making it through the slow growth period, things start to get interesting. After 200 trades, the 1.3% will be worth almost $1700 per trade – following the same trading routine. This is when exponential growth really starts to kick in. After 500 trades, the 1.3% are worth an incredible $81,000 per trade. Word of caution: Although exponential growth is not a theory but a mathematical principle that is irrefutable, you have to be aware of some trading specific issues. As your trading account growths, you will experience some “size-related issues”, meaning that getting a fill might become harder and entering a trade with one large position will become increasingly difficult. Developing patience is the most important factor when it comes to using the principle of Compound Interest. Most amateur traders make some calculations and then get too excited about where they could be in 100, 200 or 500 trades. But back in reality they get frustrated because their $2,000 account is not producing the returns they are after. 90% of your trading journey will be slow and “boring” because Compound Interest only really kicks in once your trading account reaches a certain size. Thus, most traders will never get there because they give up too early and change trading systems, hoping to find something that will generate greater returns faster. Can you accept to make little money for the next few years in exchange for a potentially high reward at some point far in the future? The graphic below shows a simulation of a trading account with relatively conservative metrics (winrate 50% and an average Reward:Risk ratio of 1.5). Most traders will only look at the right and only see how much the account grew. But they don’t understand that it took years of low returns to get there. Once you have understood that you need to be patient, it comes down to applying consistency to your performance. Everything significant that has ever been achieved is based on the principle of consistency. The tallest building in the world started with one brick and by consistently laying brick upon brick. Arnold Schwarzenegger became the best body builder of all times because he consistently worked out every single day, building his body little by little. The Fortune500 companies got to the top by making customers happy – one at a time – and by continuously making small improvements. As a trader, you have to bring your best game every single day. And even if it looks as if your trading account will never amount to anything meaningful, keep in mind that the principle of Compound Interest is irrefutable and it works every single time without exception – it’s a law of nature.